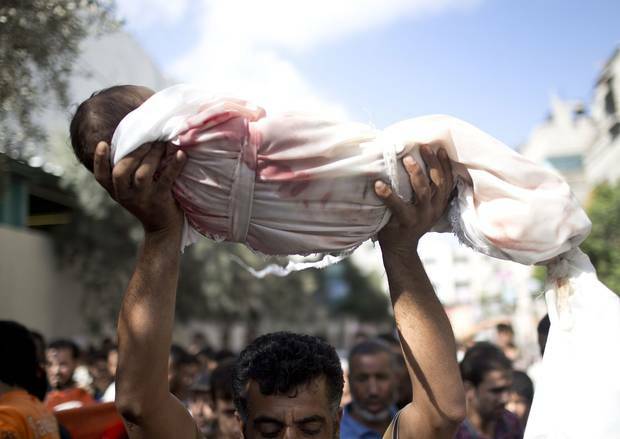 Why the dead bodies of some children we are outraged by and others we are not. Drowned 3-year-old Syrian boy Aylan Kurdi’s washed-up body is a grain of sand in the sea of horrors Western government policies inflict on the world’s most vulnerable children. The photo of the corpse of the three-year-old Syrian refugee Aylan Kurdi’s lifeless body on the beach like a discarded piece of driftwood has (rightfully so) shocked the world. A picture really does say a thousands words, and much has been written about the refugee crisis both in the Middle East and Africa, yet when we see the shocking reality of the consequences, the desperation in the image of this poor boy is truly harrowing. What’s most disgraceful is how the media’s reporting of the death of Aylan was completely detached from the reality of our government’s responsibility in creating this tragedy and its own ongoing support that allows this to happen. The Guardian’s editorial urges compassion, a sentiment absent from its pages when it came to invading Iraq, Libya and the bombing of Gaza. We can’t separate our illegal invasion of Iraq and Afghanistan from the devastating insatiability in the region. We cannot separate our neo-colonial polices in Africa, keeping the continent poor by design, set up with corrupt tyrants ensuring our unhindered access to the richness of the continent, from the torrent of desperate migrants trying to escape its consequences. 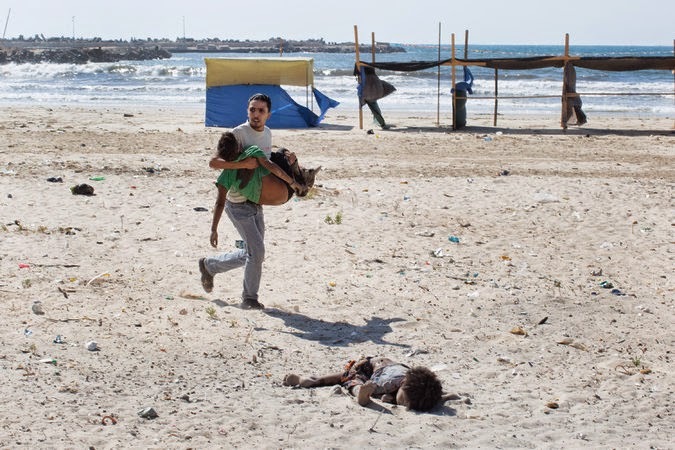 Four boys killed on beach in Gaza. The lifeless body of this boy has created an outcry, and understandably so, yet how many other children are dead as a direct or indirect outcome of our government’s polices? We only need to look at Israel’s most recent assault on Gaza, with the Orwellian title “Operation Protective Edge” to get some idea of how many dead children’s blood we have on our hands. 490 children in total murdered, cut to pieces, eviscerated and decapitated, all brutally and violently put to death for the sole reason of being born on the wrong side of a wall at the wrong time. What would have been the public’s reaction if images of these slaughtered children appeared of the front cover of every national tabloid? Outrage, commendation and immediate pressure on our government to stop supporting Israel’s murderous policies? There are some absolutely heart-wrenching and deeply distressing images of children in Gaza, either severely maimed or murdered. One in particular that just etched in my brain is a father carrying what looks like his 5-year-old daughter with both her legs blown off. The looks of pain, panic and anguish on both their faces is unforgettable; it’s humanity at its worst. Predictably so, that image never made it onto the front page of any UK newspaper, or any page at all. So it’s hard not to be cynical about these things as you see the public’s outrage being tweaked and manipulated in the wrong direction, never really being directed at the true perpetrators of the most hideous crimes: our own government and the media themselves. Having the power to provoke public opinion in the direction it chooses makes our mainstream media both complicit and responsible for the death and destruction our government has instigated over the previous decades. 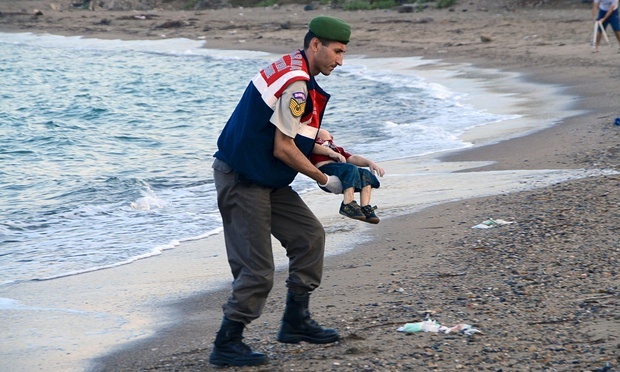 What the picture of the Aylan’s washed-up corpse tells us, without any dilution, is this is what the ugliness and tragedy of war looks like. This image is a tiny fragment of the devastation we wreak throughout the world, year after year, and how our spineless and corrupt media allows that to happen.